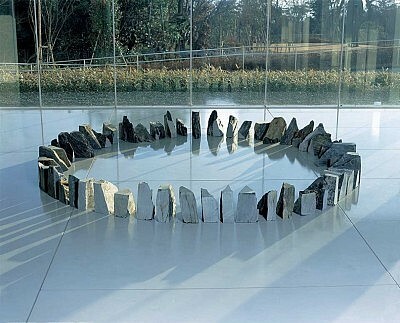 This work is made by arranging stones in a circle, which he gathered when he went to Newlyn in England. The simple form reminds us of ancient remains, such as Stonehenge or stone circle, representing a certain act by the artist at a certain time in a certain place. Richard Long has been creating works since the end of the 1960's on themes related to man and nature. He takes pictures of traces made by walking in a natural setting and creates installations by placing stones he has found in particular places, in a circle.